Wladimir Balentien doesn’t subscribe to the theory held by some that it’s easier to rebound from a slump that comes early in the year as opposed to one closer to the finish line. Balentien, who, like the rest of the Tokyo Yakult Swallows, is looking for the solution to the team’s current struggles, would just as rather have no slump to deal with at all. 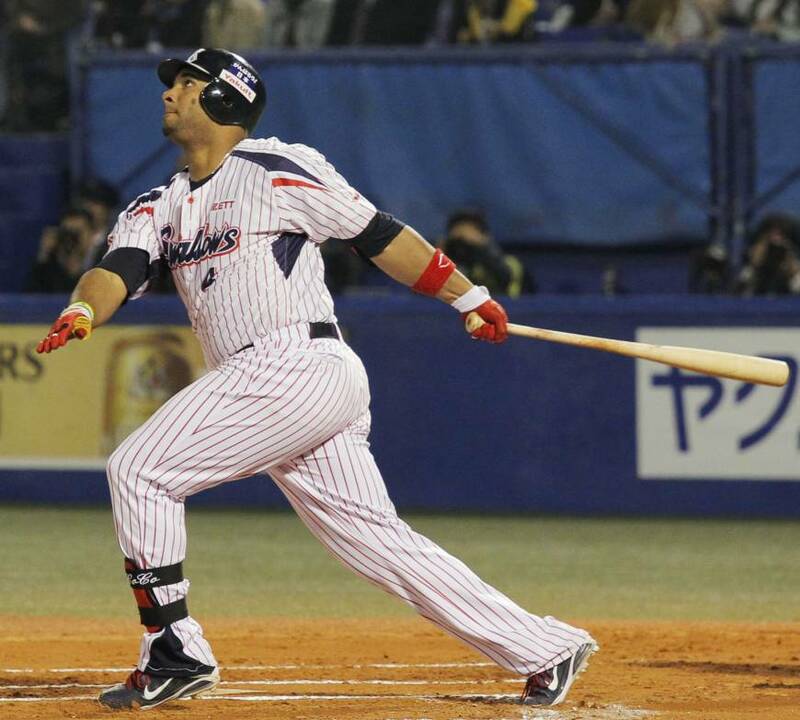 “Sometimes a lot of people say it’s better at the beginning of the season, but for me, I think I probably don’t want it at the start or the end,” Balentien told The Japan Times outside the Yakult clubhouse prior to Friday night’s 4-3 loss to the Chunichi Dragons. The season is only a few weeks old, but the Swallows are already in a free fall. Friday’s loss was the club’s ninth straight and left Yakult 11 games below .500 through 23 games. 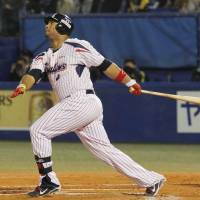 The Swallows has scored 115 runs through Friday, but had also given up an NPB-worst 144. Entering Saturday’s games, a 9-2 setback against the Hiroshima Carp was the only blowout of the nine-game skid (Yakult’s average margin of defeat has been 2.4), but the team has struggled to manufacture wins. The club certainly hasn’t been helped by the rash of injuries that began in 2013 and have carried over into this season. Yakult has already lost a number of players this season, including pitchers Shohei Tateyama and Tony Barnette, and hasn’t seen Yoshinori Sato on the mound since 2011. Balentien has been among the few bright spots. While his average is down from last season, his bat remains as fearsome as ever, as evidenced by his NPB-best 11 home runs through Friday. The slugger has tried to remain upbeat, saying “If I keep my head down, it’s going to be a long season,” and has watched his teammates try and do the same. Even so, he acknowledges that it’s a fine line to walk. Jack of all trades: Hokkaido Nippon Ham Fighters second-year player Shohei Otani is still pulling double duty and, early on at least, still doing it well. As a pitcher the 193-cm Otani has made three starts and is 2-0 with a 1.20 ERA and 19 strikeouts. At the plate, he’s hitting .391 with a team-high five doubles, a triple, a home run, and nine RBIs. What’s more, Fighters fans may get the rare chance to see Otani do a little bit of everything during the interleague portion of the schedule. With NPB having floated the possibility of the Central and Pacific Leagues swapping their DH rules (the CL doesn’t utilize the DH while the PL does), Otani could be in line to start on the mound while also hitting high in the lineup, and even possibly going from the mound to the outfield, in front of the home fans at Sapporo Dome for the first time. Glad to be back: Chunichi Dragons infielder Hector Luna might have been on his way to a big year in 2013 if not for a costly injury. Luna was hitting .350 with nine home runs, 51 RBIs and four stolen bases last season before an injury to his patellar ligament in his right knee ended his year after just 85 games. After a long offseason of recovering in his native Dominican Republic, Luna is hopeful of picking up where he left off. “I feel good about being here for my second year in Japan,” he told The Japan Times. Luna said that he sometimes worked out eight hours a day in order to get himself ready for the start of the 2014 season. “It took about four months, but I went back to the Dominican and put in a lot of work because I really had to get back to 100 percent,” Luna said. Finally healthy again, Luna was hitting .316 with four home runs and 17 RBIs through the first 24 games of the season. Welcome to the club: Orix Buffaloes ace Chihiro Kaneko reached a milestone on Friday night, recording the 1,000th strikeout of his career during the Buffaloes’ 11-0 thumping of the Tohoku Rakuten Golden Eagles. Kaneko began the night with 993 career strikeouts and reached 1,000 by fanning Shintaro Masuda in the fifth inning. Kaneko went on to strikeout seven more batters to end the night with 14 in a one-hit shutout.